FORT RUCKER, Ala. (November 14, 2014) -- Fort Rucker's Soldiers and family members work through all hours of the day, and the installation is making sure that those families are taken care of when it comes to child care. The Fort Rucker Mini Child Development Center is a 24/7 childcare facility that offers Soldiers and families who work non-traditional hours more options when it comes to child care for children from six weeks of age to 11 years old, according to Toni Hampton, acting Fort Rucker Child, Youth and Schools Services director. "The Mini CDC is designed for families that need child care outside of traditional work hours that can't be accommodated at the CDC," said Hampton. "It's for people like air traffic controllers, flight instructors, flight students or any number of those that have to work through the night. The facility offers a huge advantage for the unique population that Fort Rucker is home to, and hourly care is available on a drop-in, space-available basis, she added. 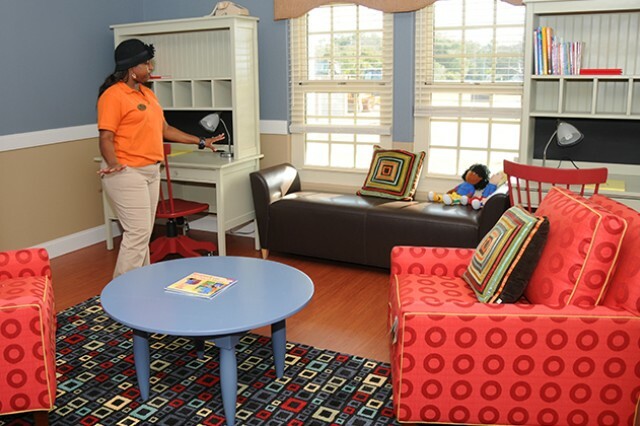 The new facility features a living room, a den, a reading area, an open area, a full kitchen, a crib room for infants, an outdoor playground and separate sleeping rooms for boys and girls. Each of the sleeping rooms are fitted with eight beds, storage compartments and full bathrooms that can be utilized for overnight care if needed, said Hampton. The concept came about around 2007 when the idea was thrown around for a facility like the Mini CDC, she said. The CDC was having issues meeting the needs of those that worked throughout the night, and some childcare providers were having to stay throughout the night to care for these children. Because of the long hours, many of the child-care providers were overstretching themselves by taking on too much, said Hampton. So, a survey was conducted and found that Fort Rucker had the right population for a 24/7 facility, and when the opportunity to get funding to build it came up, officials with the CDC seized it and the process began. The Mini CDC also meets all the same standards as its bigger sister for fire, health and safety, but can only accommodate up to 20 children at a time. "Although the capacity is much smaller, it should be able to meet the need," said the CYSS acting director. "The building is primarily for full-day care, part-day care and even hourly care on a space-available basis." The same people with the same experience that that provide care for the children at the CDC will be providing care for those at the Mini CDC -- child and youth program assistants. The assistants go through the same training program as the other childcare providers, and a manager will always be on duty at the new facility, said Hampton. Although the facility is not the first of its kind, she believes it's the first of its kind being used specifically for the purpose it was designed for. Many installations utilize hourly child care, but for Fort Rucker's population of flight students and instructors who work through all hours of the morning, Hampton said there is a greater need for 24/7 childcare, and now they're able to provide that. The Mini CDC will utilize the same lesson plans and curriculum that is used in its sister building, but will be more of a multi-age grouping depending on the children that are there, said Hampton, adding that it depends on the amount of full-time care versus part-time care and hourly children are in the facility. "We really try to meet the needs of the individual child, as well as the development of the group," she said, adding that each child is just as important as the next and the environment they will be cared for in is designed to nurture their development. For more information, call 255-2375.